The 5th annual Memory Bridge Training Retreat, co-sponsored with the Memory Bridge Foundation, was held June 1 - 6, 2017, at the Tibetan Mongolian Buddhist Cultural Center in Bloomington, Indiana. Participants from across the world shared in dedication to ending the emotional and social isolation of people with dementia through learning how to be with them in spiritually sustaining ways. The design of the retreat is based on Memory Bridge’s "I Am A Bridge" Dementia Immersion Training, an experience-centered learning model that positions people with dementia in the roles of teacher, guide, and companion. To learn more about the retreat, you can visit the Memory Bridge or contact Jane Harlan-Simmons, who leads our part of the project. This two-day event, held October 25 - 26, 2016, in Bloomington, Indiana, featured three sessions, all lead by Gary Glazner, the founder and Executive Director of the Alzheimer's Poetry Project. All three Poetry Matters sessions were free and open to the public. You can find details about each session on the Poetry Matters page. The Indiana Institute on Disability and Community and the Indiana State Department of Health, Division of Chronic Disease, Primary Care and Rural Health (ISDH), have been collaborating on the “Indiana Disability and Health Project.” On August 5, 2016, the project culminated in a statewide event, “Pathways to Health: The Indiana Summit on Disability and Health,” with national speakers on the topic of health and disability. The Indiana Governor's Council for People with Disabilities and ISDH sponsored a "5x5" Pathways to Health Contest, which ended with winners from the communities of Gary and Delaware County, Indiana, pictured above. The 4th annual Memory Bridge Training Retreat, co-sponsored with the Memory Bridge Foundation, was held June 17 - 22 at the Tibetan Mongolian Buddhist Cultural Center in Bloomington, Indiana. Participants from across the world shared in dedication to ending the emotional and social isolation of people with dementia through learning how to be with them in spiritually sustaining ways. The design of the retreat is based on Memory Bridge’s I Am A Bridge Dementia Immersion Training, an experience-centered learning model that positions people with dementia in the roles of teacher, guide, and companion. To learn more about the retreat, you can visit the Memory Bridge or contact Jane Harlan-Simmons, who leads our part of the project. Success! We had a strong turn-out! Keep an eye on the Symposium web page for photos, tweets and other wrap-up from our speakers and participants. Forget “Silver Tsunami.” An aging population is not a catastrophe, but an opportunity. We age in a community, and designing communities for aging well needs to be considered by community planners now. How can we design environments for our small, aging planet? A cadre of cutting-edge thought leaders in the field of design told us more at our Design for a Small (Aging) Planet Symposium. Six speakers, including a keynote from Scott Ball, author and leader in the Atlanta, Georgia, Livable Communities movement, presented over two days, April 30-May 1, 2015, at the Indiana Memorial Union in Bloomington, Indiana. Our Story Tent, which allows us to capture video interviews while on the road, had a busy Fall 2014. First, we attended the IN-APSE conference and gathered stories from direct-service providers. The Tent then appeared at the Indiana Governor's Conference for People with Disabilities on December 8. Interviews for the Indiana Disability History Project continue. If you would like to bring the Story Tent to your event, check out the Tent details, and contact Jennie Todd for more information. Also, our YouTube channel has scores of edited videos telling the stories of people with disabilities and the people who are connected to them. For two years, the Indiana Governor’s Council for People with Disabilities supported a workshop series to encourage advocacy for Livable Communities concepts and practices in two Indiana communities. Advocates for Livable Communities, a 5-day training process for older adults and persons with disabilities, aimed to create a cadre of highly knowledgeable and skilled advocates who could work for changes that would benefit all ages and abilities in their home communities. 2014's training communities were Richmond and Bedford, and both made great strides in recruiting participants for the fall training dates. Our Center partnered with the Center for Aging and Community at the University of Indianapolis on this project, which continues to offer technical assistance to the participating communities. On January 29, 2014, a meeting titled "The State of Palliative Care Across Settings: What Can We Do Together?" brought together 80 invited leaders in palliative care and related fields. Sponsored by the Center for Practical Bioethics, the forum was hosted in Washington D.C. by Assistant Secretary of Aging, Kathy Greenlee. Videotaped presentations from the meeting can now be viewed on YouTube.com. Dr. Philip B. Stafford of the Center on Aging and Community at Indiana University was a presenter and is included in one of the videotaped segments. Watch YouTube videos for each of the 29 segments of the Palliative Care across Settings meeting at https://www.youtube.com/user/PracticalBioethics. The Center for Practical Bioethics is a nonprofit, free-standing and independent organization nationally recognized for its work in practical bioethics. Since 1984, the Center has helped patients and their families, healthcare professionals, policymakers and corporate leaders grapple with ethically complex issues in medicine and research. With support from the CDC and the State Department of Health, this free day-long public conference helped Bloomington neighborhoods and government partners plan a healthier city through improvements in the built environment and services. This joint program of the Monroe County Active Living Coalition and Active Aging Coalition was held on Thursday, May 22, as part of the 2014 Creative Aging Festival. Find more information about the Active Living workshop and the Creative Aging Festival here. The Center on Aging and Community partnered with the City of Bloomington's Commission on Aging to host the National Center for Creative Aging's 2014 Webinar Series on Funding in Arts, Aging, and Health. Interested parties gathered at IIDC, 1905 North Range Road, in Bloomington. Attendance was free but an RSVP was required. For more information about these webinars and possible future hosting, please e-mail JaneHarlan-Simmons or call her at 812-855-2167. During the final week of June, the Indiana Institute’s Center on Aging and Community co-sponsored the first Memory Bridge Training Retreat for school teachers and those who work with people with dementia, such as service and care providers, administrators, etc. In its first year, the Retreat’s participants were selected by scholarship application. Fifteen professionals from nine U.S. states and Greece, dedicated to ending the social isolation of people with dementia, were awarded scholarships to attend the 5-day training. The Retreat was held at the Tibetan Mongolian Buddhist Cultural Center in Bloomington, Indiana. The format of the Retreat was based on the Life Is a Bridge Dementia Immersion Training, an experience-centered learning model that positions people with dementia in the roles of teacher, guide, and companion. Retreat participants were matched one-on-one with elders with dementia living at the Autumn Hills Alzheimer’s Special Care Center in Bloomington. The training was led by Memory Bridge Founder and President Michael Verde. Naomi Feil, Founder of the international Validation Training Institute, was a featured speaker. The Memory Bridge Foundation for Alzheimer’s and Cultural Memory creates programs that connect people with Alzheimer's disease and related dementias to family, friends, and others in their local communities. Its goal is to create a global community that is learning to listen to people with dementia for what they have to teach us about our own humanity. Phil Stafford, Director of the Center on Aging and Community, is a member of the Memory Bridge Executive Board. For more information about the Retreat, visit the Memory Bridge website or contact Jane Harlan-Simmons (jeharlan@indiana.edu). The Center on Aging and Community was heavily involved with the 2012 Indiana Communities for a Lifetime initiative. Dr. Philip B. Stafford, Center Director, was acknowledged for his contributions to the development of the program on the same day the communities of Linton, Valparaiso and Huntington received their funding awards, Friday, February 8, 2013, at the Indianapolis offices of the Indiana Housing and Community Development Authority. In 2013, The Communities for a Lifetime Initiative joined a $1.3 million national initiative called Community AGEnda: Improving America for All Ages. Supported by Pfizer Foundation and Grantmakers in Aging, a national association of funders, the national effort continues to help nonprofits in five U.S. regions accelerate local efforts to make towns and cities “age-friendly” – that is, great places to grow up and grow old. The cities of Huntington and Indianapolis received consultation and support to enhance the growth of “naturally occurring retirement communities” where local planning efforts incorporate an age-friendly perspective, inclusive of all ability levels. Also, community leaders and policymakers in Bloomington continue to explore developing incentives to encourage age-friendly neighborhood development. For more information, contact Phil Stafford at staffor@indiana.edu or call (812) 855-6508. In the Spring of 2013, Phil also was featured in the faculty spotlight on the IU Research home page. The article is archived here if you'd like to know more about Phil's work and views on communities for a lifetime. Supported by Indiana Protection and Advocacy Services and the Indiana Governor’s Council for People with Disabilities, a second series of workshops were again offered in the Spring of 2013 to 20 adults with intellectual/developmental disabilities from around the state. Building Leadership Series (BLS) 2 consists of three two-day workshops and will be back in the Spring of 2014. Topics include civic engagement, relationships and romance, and healthy living. If you'd like to know more about the entire series, visit our BLS pages. Places with a Purpose: Communities for a Lifetime addressed what a Lifetime Community is and how Indiana communities can work toward becoming the kind of places where people want to live from their youth to old age. The May 8, 2013, event was held at the Ivy Tech campus, with a keynote from Jan Hively, "Purposeful Lives Create Good for Everyone." Architects M. Scott Ball and Zachary Benedict, as well as Health By Design's Kim Irwin also spoke at the event. For more information on the presenters and our sponsors for this event, read or download this flyer with event details. We especially appreciate Ivy Tech's Katrina Jones for her help in organizing the event and registrations. If you'd like to read about other May 2013 Creative Aging Festival activities in the Bloomington Area, visit the City's Commission on Aging page for event brochures. We had $150,000 in 2012-2013 to help Indiana communities prepare for the massive growth of the older adult population, thanks to the Pfizer Foundation and Grantmakers in Aging. Efforts were concentrated in Huntington and Indianapolis, where staff offered consultation and support to enhance the growth of "naturally occurring retirement communities" or NORCs. We encouraged local planning efforts to incorporate age-friendly perspective, inclusive of all ability levels. Also, community leaders and policymakers in Bloomington explored developing incentives to encourage age-friendly neighborhood development. You can read more about this exciting project here or here. We have been thrilled that more groups are recognizing the need for lifetime communities. In the fall of 2012, our Center moved to the national forefront of the "elder-friendly" communities movement. Worldwide, cities continued to join the "age-friendly community" movement led by the World Health Organization. In Indiana, the relevance of the age-friendly community concept to other audiences, especially people with disabilities, led to a broader focus called "lifetime communities" (reflected, in part, by the re-naming of our Aging Indiana web site to LifetimeCommunities.org). The Governor’s Council for People with Disabilities, in particular, invested heavily in activities designed to promote awareness of the concept through workshops, publications, and, notably, the December 4-5, 2012, Governor’s Conference. Richard Jackson, M.D., M.P.H., of the UCLA School of Public Health and author of Designing Healthy Communities, featured in a major PBS series on the topic in the spring of 2012, spoke at the conference. CAC continued to provide leadership to the Indiana lifetime communities movement. Our director, Dr. Phil Stafford, helped coach Community for a Lifetime initiatives in Linton, Huntington and Valparaiso, Indiana. With support from the Indiana Housing and Community Development Authority, these communities engaged in participatory planning and prepared implementation plans to present to the state agency in September 2012. The communities received funding to help make structural changes to their cities that opened up public spaces to people of all ages and abilities. In May, 2013, Dr. Stafford provided a plenary address at the International Making Cities Livable Conference in Portland, Oregon, and he chaired extended sessions on age-friendly communities at the American Society on Aging meetings in March, 2013, and at the International Union of Anthropological and Ethnological Sciences in Manchester, England, in August, 2013. He also served as a consultant to the upcoming documentary titled Coming of Age in an Aging America, produced by Vital Pictures for public television. Our staff ran the Story Tent and spoke at several sessions of the 2012 Conference for People with Disabilities and Community Advocates. With a theme of "Community Connections", the conference focused on topics right up our alley, so we're played a big role there. Jennie Todd and Sharon Baggett, Associate Professor of Aging Studies at University of Indianapolis, facilitated "Design for Building and Supporting Livable Communities" twice on December 4.They explored the latest design principles in the broadest sense,including streets, housing, landscape and community spaces. Jane Harlan-Simmons participated as a panelist for the December 4session, “The Intersection Where Art and Culture Meet,” which was a look at how arts and community leaders could work together to create sustainable communities through creative economy development. Director Phil Stafford moderated a panel comprised of Mayors, planners, and business and arts leaders on December 5, reviewing Indiana Livable Community Initiatives. Finally, everyone, including Peggy Holtz and our good friends Steve Savage and Ken Oguss, staffed the annual Story Tent project throughout the day on December 4, collecting stories about community living. Dr. Stafford presented "Aging in Place" on October 11, 2012, in Indianapolis on behalf of the Indiana Association for Community Economic Development. The training was made possible in part by the Indiana Housing and Community Development Authority. Spring, 2012 - With support from the Indiana Housing and Community Development Authority and the Governor’s Council for People with Disabilities, three communities to participate in a new planning grant program were announced on March 1, 2012. This program – Communities for a Lifetime – will support Huntington, Linton and Valparaiso with small grants to identify a district, conduct assessments, and engage people of all ages and abilities in creating a more livable environment that supports social, mental and physical health, and independence across the lifespan. The three communities will have approximately 6 months to conduct their planning activities and develop an implementation plan for additional funding from the IHCDA and other potential sources. Eligible projects will include affordable housing, home repair and modification and economic development activities. The Governor’s Planning Council intends to support training for planning advocates among the older adult and disability community. The Center on Aging and Community has been working to foster this program for several years. Director Phil Stafford and Research Associate Jennie Todd will be providing significant technical assistance to the grantee communities. For more information about the program, write Dr. Stafford at staffor@indiana.edu or visit the program announcement page here. ArtsWORKIndiana.org debuted a new look and new user-friendly design in the Spring of 2012. Along with a face lift, the site made navigation and content changes so it would be easier to find and use information. There continues to be plenty of art by Indiana's visual artists with disabilities throughout the ArtsWORK site pages. The remodeling of the website was made possible, in part, with support from the Indiana Arts Commission and the National Endowment for the Arts, a federal agency, as well as by the Indiana Institute on Disability and Community. The Center on Aging and Community’s Director, Dr. Phil Stafford, took part in a Community Matters discussion on Silo-busting in December, 2011. 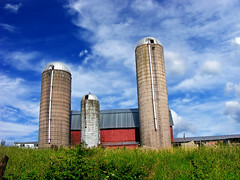 We all tend to create silos in our life - places that are our own domain and from which we rarely like to venture. Communities also have silos -- many address youth issues and elder issues separately, and both are separated from issues like housing, transportation, education, and volunteerism. One way to break down community silos might be to focus on building communities for all ages. The podcast is at the bottom of the discussion page and can be downloaded. There are call notes available as well. Back for a second year, this festival coincided with Older Americans Month, and our Center was again involved in several events. Visit our Creative Aging Festival 2012 web page for a run-down of all our related activities. The City of Bloomington Commission on Aging invited the community to celebrate creativity and our aging population. There's a beautiful full-color brochure of events here, and a master list here. All events were accessible for people who use wheelchairs. We had a terrific turn-out! Spring of 2012, past participants of our Building Leadership Series (a series of workshops for adults with intellectual/developmental disabilities) have been coming together again for a second set of workshops. They’re learning about and discussing topics such as relationships and intimacy, civic engagement, and healthy living. Sponsored by Indiana Protection and Advocacy Services and the Indiana Governor’s Council for People with Disabilities, these workshops provide an opportunity for participants to learn in a safe, highly interactive environment with their peers. For more information contact Jennie Todd at jeptodd@indiana.edu and visit our Building Leadership Series 2 page. ArtsWORK Indiana formed a regional affiliate for South Central Indiana with monthly meetings in Bloomington. You can still join the group to promote supportive networking and build arts career-related skills. Not only is there the enticement of refreshments at these meetings, but you could make new friends as well! Bloomington Fiber Artist Martina Celerin spoke at a meeting on "Transitioning into an Art Career", pictured above. Interested in attending a regional meeting? Visit the ArtsWORK web site for more information. Our staff were kept hopping last year, taking the Story Tent to several events and locations in Indiana. People's stories on a wide range of topics -- including food, senior living, autism and school bullying -- were recorded and turned into short YouTube video clips. To view the results of our Story Tent activities, please visit our Video Center for playlists and more information. We look forward to meeting more of you and gathering your stories in years to come! Phil organized and presented at the Indiana Association for Community Economic Development (IACED)'s two-day training on Aging in Place this past September. Aging in Place took place September 6 and 7 in Indianapolis. This is the second year that IACED has asked Phil to present this training. Phil discussed Aging and Developmental Disabilities: A Family (and Community!) Affair at the 4th Annual Mid-America Institute on Aging conference, held August 11-12. If you'd like to learn more about this multi-disciplinary gerontology conference for nurses, social workers, older adults, lay persons, and professionals working in the field of gerontology, visit the conference web page or browse the conference brochure. Inaugural Creative Aging Festival in Bloomington: The month of May is Older Americans Month. The City of Bloomington Commission on Aging and the Center on Aging and Community invited the community to participate in a month-long, city-wide celebration honoring our elders and their creative contributions to our community. The calendar of events and more information on the May 2011 festival activities are still available from the City of Bloomington. CAC proudly sponsored the Food for Thought traveling exhibit's visit to Bloomington in May, 2011. Visitors could see, touch, taste, hear and reminisce about Indiana food culture through the artifacts, images, hands-on learning tools, and oral history at the Food for Thought booth.A historical and contemporary look at Indiana’s food culture, as well as interactive opportunities for Hoosiers of all ages, was experienced by those who visited the exhibit. Food for Thought,part of the city-wide Creative Aging Festival in May,was sponsored by our Center and partially funded by Indiana Humanities and the National Endowment for the Humanities. The exhibit was housed at Bloomington's City Hall Atrium, 401 N. Morton Street, May 7 - 20, 2011. Our director, Phil Stafford, presented on The Aging Workforce with the University of Indianapolis' Ellen Miller at the Indiana Chamber of Commerce's 47th Annual Conference, focusing on the Changing Face of Human Resources. For more information on the conference, you can visit the Chamber web site or check out the conference brochure. Dr. Phil Stafford wrote a companion op-ed piece to an Indianapolis Star article about embracing Indiana's senior population. He discusses the challenges and opportunities of aging in place. Read more at the Star web site. The Indiana Civil Rights Commission, working with the Back Home in Indiana Alliance, Indiana Governor’s Council for People with Disabilities, and the Indiana Institute on Disability and Community, held a Fair Housing Conference titled Fair Housing and Beyond, on Friday, April 8, 2011. The conference focused on providing equal housing opportunities for individuals with disabilities. Our own Dr. Phil Stafford, a Center Director for the Indiana Institute on Disability and Community at Indiana University, was the closing Keynote speaker with a presentation on Communities for Life: Getting from House to Home. For more information, visit www.in.gov/icrc/beyond.htm. Dr. Phil Stafford, our director, discusses his book Elderburbia: Aging with a Sense of Place in America with Lorell LaBoube of the Bioethics Channel. This lively interview is about 17 minutes long and can be found under July on the Bioethics Channel page. Use this direct link to open the MP3 interview automatically. Planning Tools for Elder-Friendly Communitiesprovide valuable information to citizen planners and activists, as wellas professionals in aging. Made possible by the Daniels Fund, these newtools are available for free download at Aging Indiana. The Communications Toolkit offers strategic media messages and story lines for the key indicators of an elder-friendly community. How to Develop a Home Modification Initiative describes how to create a community coalition to advocate for the availability of affordable home modifications. Mental Health in Older Adults will assist communities to address unmet mental health needs in their older residents. The three new publications join an additional guide also available on the Aging Indiana website, Evidence Based Interventions to Improve Physical Activity in Older Adults. The guidebooks are in Adobe PDF format. Adobe Acrobat Reader is available for free download here. Communicationis hard enough in normal circumstances, let alone those situations in which an individual being served has cognitive changes associated with forms of dementia. Participants in the workshop left with the belief that persons with dementia are never "not here" – that it is our inability to communicate, not theirs, which results in social isolation and so-called loss of self. The workshop was held November 29-30, 2010, at the Center for Aging and Community in Indianapolis' Fountain Square. For further workshop details, visit the It’s Not a Case, but a Person web page. Available with articles by CAC staff is the Winter 2010 edition of the Impact Newsletter, which is a feature issue on Aging and People with Intellectual and Developmental Disabilities. Published by the Institute on Community Integration at the University of Minnesota, this issue features articles on family relationships,spirituality, health, futures planning, community inclusion, and more! For a complimentary copy as long as they last, call the Institute on Community Integration's Publications Office at 612-624-4512 or email icipub@umn.edu. The issue is also available on the Web at http://ici.umn.edu/products/impact/231. The Center participated in an Institute-wide open house on Wednesday, April 28,2010. We celebrated the Indiana Institute's 40th anniversary and continued service in disability to Hoosiers across Indiana. We had our doors open from 11 am - 6 pm with a showing of "When Did I Grow Old?" from 5 - 6 pm. We had a great time meeting all that attended. Thank you for your continued support! Inside Indiana Business cites CAC's research on Indiana's aging workforce. Staff have long been gathering stories from people with disabilities. View new interview footage on the Center's Video Collection page. View new interview footage on the Center's Video Collection page. The Building Leadership Series project concluded its fifth and final year. The series consisted of three two-day workshops attended over a course of three months. For more information, visit our Building Leadership Series pages. I am Citizen Prepared is a publication for people with disabilities and the people who support them. Emergency preparedness is a topic that is on the minds of many Americans these days in light of the 9-11 tragedy and subsequent terrorist attacks all over the world. There is much written about the subject, but not in a format that is accessible to people with intellectual/developmental disabilities. I am Citizen Prepared is designed to provide information that does not focus on the scary aspect of disasters and emergencies. It offers the reader suggestions on how to prepare oneself in the event that an emergency does arise. The reader is encouraged to think of emergency preparedness as a project rather than a reaction to an unexpected and frightening event. Adobe Acrobat Reader is available for free download here. A free guide to online career resources for people in Indiana is now available in both a glare-free Adobe PDF file as well as a printer-friendly PDF file. The Voice of the People poster series highlights common concerns and wishes of people with disabilities told in their own voices. For more information, further description, and an order form, download the Poster Flyer in Adobe PDF format or go to our Products Section. We at the Center on Aging and Community are excited to announce the completion of the Home Modification Report. If you're even more curious, you might check out our Resources Section for more online resources about this subject - just go to the list labeled "home modification." The Center on Aging and Community collaborated with multiple units of the university to sponsor and coordinate a series of academic and public events that explored the relationships between memory and place and identified how memories and remembering, as a civic engagement process, benefit individuals and communities. Held in Bloomington February 22-23, the workshop brought together a unique assemblage of humanists, social scientists, community-based practitioners, information scientists and the local community to explore how new technologies can help sustain individual and community memory. For a complete description of events, visit the workshop blog at www.puttingmemoryinplace.blogspot.com.